Iran Visa Policy 2019: Are You Eligible to Get an Iran E-Visa on Arrival? Whether Iran is your next destination or you are just considering visiting Iran in the future, here you can read detailed and updated info about Iran visa policy. We follow all policy/law changes and update the info frequently. As the Iranian Ministry of Foreign Affairs (MFA) clearly states, all visitors to Iran must obtain a visa from one of the Iranian diplomatic missions, unless they are from an Iran visa free country or country eligible to obtain an e-visa on arrival (e-VOA). Fortunately, due to recent changes in Iran’s visa policies, today most nationalities can apply online for a visa and get their electronic visa on arrival. Also, Iran no longer affixes visas to passports nor stamps them on entry as a response to the US sanctions on persons who have visited Iran after 2011. So, visitors can easily travel to Iran free of all worries in this regard. In addition, British, Canadian and American citizens are permitted to travel to Iran ONLY through official government approved escorted tours. It means they can’t travel individually inside Iran. Israel citizens are totally banned from entry into Iran. Infographic: Iran Visa Policy, Jan. 2019. Iran is considering visa-free travel for 60 countries in the near future. Until that time, only a limited number of countries can visit Iran visa-free. Citizens of the following 8 countries can enter Iran without a visa, but it is not clear if at land borders this law is implemented. Citizens of the above countries who intend to stay in Iran more than the specified visa free time, have to apply and get a visa for their duration of stay. All visitors (except a few countries) can apply for a visa online before their departure and receive their 30-day e-VOA at Iranian international airports. Still, citizens of Afghanistan, Bangladesh, Canada, Colombia, Iraq, Jordan, Pakistan, Somalia, United Kingdom, and United States need to arrange and collect their visas before arrival. The e-VOA is currently available at major Iranian international airports although it is not possible at all the land borders. Type (C) which is the Pilgrimage visa. These visas allow visitors to stay in Iran up to 30 days and they are extendable for up to two additional months. The MFA has already announced that they are working to extend the Iran VOA duration to 90 days in the near future. All tourists who would like to receive an Iran e-visa on arrival should have applied online at least 2 days before their arrival and have gotten their “Iran Visa Grant Notice” or at least “Submission Notice” via email. Having an Iran visa grant notice, guarantees and facilitates visa issuance on arrival. Also, all travelers to Iran must have valid travel insurance to get the e-VOA. You can buy one at the airport and pay in cash (the office is 24/7) or buy one and pay online at our website for a reasonable price. Please consider that these visa prices are normally more than what you would pay if you collect your visa from Iranian Embassies/Consulates before departure. Also note that all payments at Iranian international airports should be made in cash, in Euros and credit or debits card are NOT accepted. For more details on the Iran e-VOA please read the page: “Iran Visa on Arrival” on our website. All tourists (any nationality except Israelis) may stay in Kish Island, Qeshm Island, or Chabahar for up to 30 days without obtaining any kind of Iranian visa. This includes Americans, British and Canadians and they can travel to Kish and stay for 1 month without any difficulties. However, these tourists have to get a visa if they intend to enter the Iranian mainland from these islands. The process of getting a visa from Kish or Qeshm islands and its price is the same as the e-VOA. Although citizens of the US, UK and Canada are welcomed to visit Iran, they are subjected to stricter policies to get their Iran visas. They are not entitled to get their visa on arrival and need an Iran visa authorization code from an authorized Iranian travel agency to be able to travel to Iran. Moreover, for these three nationalities, more authorizations are also needed. They have to travel to Iran as a part of organized and authorized tours and even if they are only one or two, have to be accompanied by an authorized tour guide during their stay in Iran. Since there is a lot of socio-political history between the USA and Iran, Americans travelling inside of Iran are strictly monitored. This monitoring starts from the start of their journey, which is the visa collecting process. However, politics aside, Iranians have a very hospitable culture and so the government endeavors to make all of their visitors – regardless of nationality, race, beliefs, and etc… – feel welcomed and safe. In addition, the tourist visa issuing process for US citizens is also monitored by the Guardian Council. When an American citizen or a group apply for visas the receptive Iranian agency should render the request to the ICHTO. This Council makes and observes all the processes from visa issuing to entrance and then exiting the country. The tourist(s) requests the receptive Iranian agency to apply for an Iran visa authorization number for him/her. The agency declares it to the ICHTO, and in turn it appoints the guide, accommodations, and itinerary.  After getting the confirmation from the ICHTO, the agency applies for visas in the MFA e-visa system. It may take around 2 months for MFA to approve visas. The visa will be issued exactly based on the submitted itinerary. Finally, you should consider that travelling to Iran individually as a citizen of one of these three countries is not possible and you are only allowed to travel to Iran as a part of an organized tour or accompanied by an authorized tour guide. The Iranian government does not officially recognize Israel as an independent country and so citizens of Israel are totally banned from entry to Iran. However, if any Israeli has dual nationality and has another passport, he can travel to Iran with his other passport. Also, anyone with a travel document containing an Israeli visa, Israeli entrance stamp, or evidence of any other connection to the Israeli state will have a many obstacles getting an Iran visa. Most Iran visa holders are able to extend their visa for up to 60 days while they are in Iran. To extend the visa, the applicant has to refer directly to the Immigration and Passport Police, which is located in all large cities and submit his/her request to extend the visa. Also, evidence showing the reason for extending his/her stay must be given. The chief of office or his deputy will assess the provided documents and decide about visa extension. The visa extension fee is 345,000 Rials for up to 30 days and 800,000 Rials up to 60 days. Evidence and documents showing the need to stay more in Iran. It could be an official medical, marriage, MFA or other document. Getting approval from the chief of Aliens Affairs Department or his deputy. Your passport with validity more than the requested time of your visa extension. Copy of your passport information page, visa page and enter and exit stamps. The Iran visa extension request has to be made by the applicant him/herself and no one or travel agency can do it on behalf of the client although someone can accompany you to the office. You have to submit your visa extension request in time and before your visa expiry date. If you do it after your visa expiry date, you have to pay a penalty (450,000 Rials) for every extra day you have stayed in Iran without a visa. If you have already stayed in Iran for more than 7 days without a visa, then it is not possible to extend your visa and you have to go to court and wait judgment. Working Hours: Saturday to Wednesdays: 07:30 to 13:30. Thursdays: 07:30 to 11:30. Working Hours: Saturday to Wednesdays: 08:00 to 14:00. Closed on Thursdays and Fridays.